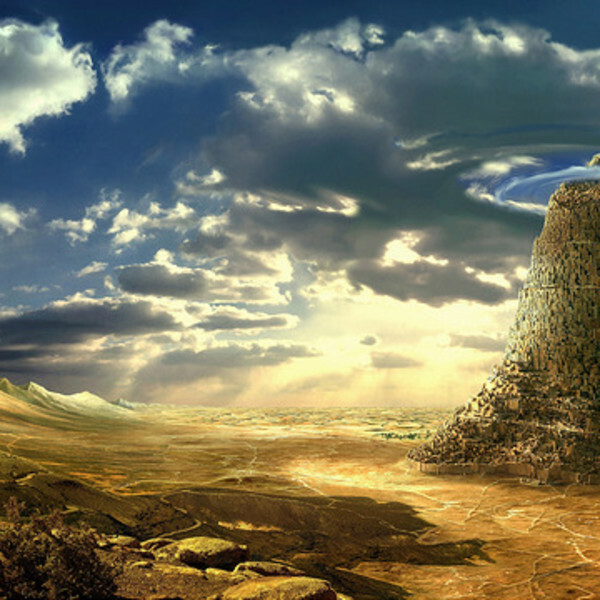 Perhaps no biblical story has captivated people’s imaginations like the Tower of Babel. In this story, a group of people get together to build a tower tall enough to reach heaven—from which they intend to launch an all-out war on God himself. God sees what the people are building, and furious at their hubris, destroys the tower, and condemns humanity to the Earth. Or something like that. That’s not really in the Bible, but it’s what a lot of people hear and repeat. It’s almost like they mashed up the Bible with Icarus, Prometheus, and Jack & the Beanstalk. And every time someone feels like humanity is advancing too fast, they pull out this story, and try to slap people down with it. In doing so, they may be unwittingly enacting the Sin of Babel themselves. In the Bible, the Tower of Babel has a context. When God created humanity, he created them in his image, made them godlike (Genesis 1:26-28), and instructed them to participate in his work, creating and cultivating the life of the world, just as he had done. Growing into that immense role would take time, though. The very first thing humanity had to do was to become a planetary species. These are God’s first instructions to humanity: be fruitful and multiply (so there would be more humans to help), and fill the earth—so that the work could be truly global in scope. And that’s exactly what humans started doing. But then someone had a different idea. There’s a lot going on here. Notice, first of all, they’re not setting out to build a tower, they’re setting out to build a city. In the book of Genesis, this is a red flag—so far, the good guys are nomads, spreading out across the landscape, filling the earth, while the bad guys are city-builders, murderous tyrants trying to batten down the hatches, surround themselves with walls, and hold their ground. The Bible’s first city-builder? Cain, right after he slew Abel. Sure enough, there’s something very similar going on here. Why do they want this city, and why does this city need to have a tower? According to their own account, they’re doing this to make a name for themselves, so that they can avoid being scattered over the face of the earth. It’s a brilliant idea. If they make the most famous city ever, no one will ever want to leave. People will be so proud of where they’re from, no one will ever venture out to explore new possibilities or new places. And here’s the crux of the problem. They were supposed to be exploring new possibilities and new places. God had just told them to scatter over the face of the earth. That was part of their mission, part of what they needed to do to keep growing, so they could become the planetary species God had always intended them to be. God wanted humanity to grow—these people wanted things to stay the same. They were rejecting God’s mission of ongoing change and growth, and choosing instead to aggressively defend the ways things were. Defending the way things are, at the expense of a better future, is the Sin of Babel. They had started work on their project, and sure enough, God confirms that humanity was powerful enough to build these kinds of things. After all, God had made them that powerful. So what’s God’s problem with this? According to what God says, the problem is not the tower—it’s that this tower indicates that the rest of their plans are within reach. Including the plan to never, ever leave. If they don’t want to fill the earth, they won’t. The grand project God intended for the human race will come to an end right here, as they get absorbed in a project specifically designed to thwart God’s intentions for continued growth. This wasn’t just a one-time issue. Even if God stopped this project, the next project would spring up, and the next, and the next. Humanity seems intent on defending the ways things are, at the expense of the much greater future God intends. What kind of society engages in grandiose building projects just to make itself famous? What kind of society is determined to make sure no one ever leaves? What kind of society would every Jewish family think of, when hearing a name that sounds like the root word of “Babylon”? Over and over in the biblical story, tyranny is what stands opposed to God’s plans for humanity. The tyranny of Egypt, Babylon, and Rome stand against newness and growth and life. Right here in the beginning, we’re seeing just how destructive this kind of tyranny can be—if nothing is done, it will erase the glorious future of the human race. So God comes up with a plan of his own. God will introduce linguistic diversity into the human race. Diversity will disrupt tyranny, making it hard for there to be any single source of power. Without a single source of power, there will be a world of plurality and difference, and no one will ever be able to completely eradicate change. Diversity is God’s answer to tyranny. That’s exactly what God does, introducing a diversity of languages. And so, as the story sums up, the project grinds to a halt, people go back to spreading and exploring, and humanity is scattered over the face of the whole earth (Genesis 11:9). Just as God always intended. It’s remarkable what’s not here. God doesn’t destroy their tower. God doesn’t forbid them from building new towers. God doesn’t even forbid them from building cities—though a righteous city-builder will take a few more generations to come along. God doesn’t show any indication of being furious with them, let alone being afraid they’re about to storm his gates. The whole story is about this: Will humanity continue to spread out and grow, as God intended, or will they build power structures that defend the way things are, and resist the ongoing process of change? God, seeing that humans keep being drawn to oppressive power structures, introduces diversity as an answer to tyranny. God’s plan works, these growth-rejecting projects are thwarted, and humanity goes back to growing into a planetary species. That’s the end of the Babel story in Genesis. But it’s not really the end of the story in the Bible. In the New Testament, when the Christian church is launched on the day of Pentecost, the Tower of Babel is symbolically reversed. Where Babel marks the introduction of the confusion of different languages, Pentecost marks the beginning of a new unity, where everyone can understand each other. Pentecost doesn’t do this by eliminating all the diversity God introduced at Babel. Instead, it does this by equipping people to understand and appreciate that diversity. The brand-new Christians find that they can communicate in different languages, and understand people from far different backgrounds. Babel was a moment when humanity turned in on itself, and threatened to become tyrannical, self-absorbed, and stagnant. With the introduction of diversity, God saved humanity from tyranny, and gave it back its mission. But it came with a downside. Diversity cost humanity its unity. At Pentecost, that dilemma is finally answered. In partnership with God, we can bring about greater unity through—and not in spite of—our diversity. In partnership with God, we can learn to understand and appreciate each other’s differences, and be stronger for it. And that’s all part of God’s plan for us to move beyond the way things are, toward the much greater future God intends. > Find out more about Christian Transhumanism.